THE Manchester Arena terror attack affected all fans of live music, but the music has to go on. So six days after the horror in Manchester, Kiss staged their extravagant show in Birmingham. The American rock legends had announced just two days earlier that they were cancelling their show in Manchester on Tuesday. It’s likely the decision was taken out of their hands as the Arena — where 22 people were murdered as they left Ariana Grande’s concert — was still a crime scene and there were reports that the bomb blast had caused structural damage. But Kiss made sure that everyone knew that their thoughts were with Manchester as they stopped the Birmingham show on Sunday after two songs for a silent tribute — as they had done in Glasgow the previous evening and in Franfurt and Rotterdam last week. “We think it only right for a moment’s silence for our brothers and sisters, mums and dads in Manchester,” lead singer Paul Stanley said on Sunday. Walking to the concert hall, fans would have felt reassured by the sight of armed police. In fact, fans congregated at nearby pubs and restaurants looking pretty relaxed. Security at the 16,000 capacity venue was pretty tight with every person being searched. But for a few hours, people could put the terror attack out of their minds. Many people look upon opening act The Dives with disdain, believing they only landed the support slot because frontman Evan Stanley is the son of Kiss founder Paul. They couldn’t be more wrong. The four-piece band sound nothing like Kiss — Evan admitted in an interview that he doesn’t really listen to his father’s music. Influences are more Elvis Costello, The Squeeze and The Kinks. And they must be doing something right, judging by the queue of fans waiting to meet them during the interval. Anyone who didn’t buy a copy of their debut EP Everybody's Talkin’ in the break was out of luck as it had sold out by the time the lights came up. Kiss, as always, put on an amazing show. Opening with Deuce, it was one classic after another from the greatest band to ever grace a stage. Shout It Out Loud, Lick It Up, I Love It Loud, War Machine, Firehouse — complete with Gene Simmons’ fire-eating — and more wowed the sell-out crowd. I thought that because of the terrorist attack, Kiss might do away with their pyrotechnics and fake blood. But no, they refuse to let terrorists tell them what to do. So there were the explosions — although maybe not as loud as before — and Gene dribbled blood during his bass solo as he was hoisted onto a platform 30 feet above the stage to perform his signature tune, God of Thunder. Guitarist Tommy Thayer was given his moment in the spotlight to perform Shock Me. Then Paul spoke about all the well-known songs on the classic album Destroyer before surprising fans by introducing the rarely-played Flaming Youth from that album. Everyone sang their hearts out during all the songs, but especially so for Crazy Crazy Nights. The only newish song played was Say Yeah from Sonic Boom. Paul zipwired to a platform in the middle of the arena for Pyscho Circus before heading back to the main stage for Black Diamond, performed by drummer Eric Singer. As Kiss anthem Rock and Roll All Nite was performed, cannons fired so much confetti in the air that I felt sorry for the arena’s cleaners. 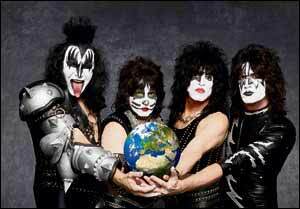 Encores were I Was Made for Lovin’ You and Detroit Rock City. I love the use of hydraulics at Kiss gigs with the band spending just as much time being lifted into the air as they do on the stage. During Rock and Roll All Nite, Gene and Tommy were lifted over the crowd in crane-like arms giving everyone a chance to see them close up. At one point, Paul asked the audience if anyone was seeing the band for the first time. “You never forget your first Kiss,” he said. And how envious I was of those first-timers. The first time I saw them in October, 1983 at Leeds Queens Hall, they weren’t in their trademark make up. But every time I have seen them since, they’ve been in character. My only complaint is that they couldn’t do more songs. It would take them about 10 concerts with no repeats to keep every fan happy so amazing is their back catalogue. Paul and Gene have talked about calling time on the band when they hit their 70s — which is only a couple of years away. Hopefully they will say goodbye in a proper way with a full UK tour.